Version 2.1.0 is an update to Splatoon 2 released on 13 December 2017 at 02:00 UTC. 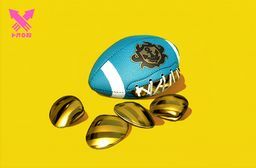 The Clam Blitz mode was made available. It was immediately playable in Private Battle. The first opportunity to play it in Ranked Battle or League Battle was with the scheduled rotation starting at 04:00 UTC, 2 hours after the release of version 2.1.0. Fixed an issue in which a player submerged in a wall or a thin ground surface would take damage from the opposite side of the terrain. Fixed an issue in which a player behind a Splash Wall or a launched brella would take damage from the opposite side if the distance between the player and the Splash Wall or brella was close. Fixed an issue on Sturgeon Shipyard in which if a certain wall was hit with a bomb, ink would splash onto a nearby wall that players were occasionally unable to submerge into. 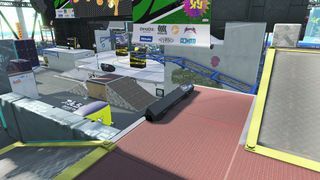 Fixed an issue in Splat Zones on Moray Towers in which the border indicating the Zone area was incorrect for part of the Zone. Fixed an issue on Manta Maria in which, if a player did a Splashdown on a specific place, they would be treated as out of bounds after landing and be splatted. Fixed an issue in Turf War on Manta Maria in which the area beneath the thick pillars was inkable, and was counted as part of the turf. Fixed an issue in Tower Control on Manta Maria in which players were able to jump from a high spot near the center of the stage to a part of the opponents’ base. Fixed an issue on Blackbelly Skatepark in which players could jump higher than normal near the start point and go over certain obstacles. 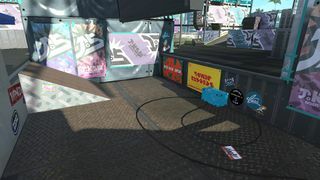 Fixed an issue on Blackbelly Skatepark in which if a certain wall was hit with a bomb, ink would splash onto a nearby wall that players were occasionally unable to submerge into. Fixed an issue in Tower Control on Blackbelly Skatepark in which players could climb over a wall not intended to be climbed over by jumping from the top of a tower at the right moment. Fixed an issue on MakoMart in which if a certain wall was hit with a bomb, ink would splash onto a nearby wall that players were occasionally unable to submerge into. Fixed an issue on MakoMart in which a certain railing could be seen through by pulling the camera close to it. Slightly adjusted the tower path in Tower Control on MakoMart in order to fix a rare issue in which the player could be sandwiched between the tower and terrain, causing them to be pushed inside the terrain. Fixed a rare issue in which, when the player does a Splashdown near a tower, they could pass through the terrain and fall out of the stage. Fixed an issue in which, if the player closed their umbrella the moment that a bomb exploded, neither the umbrella nor the player would take damage. Fixed a rare issue in which two Ink Storm clouds would be generated when a player directly hit a Splash Wall or brella with an Ink Storm, depending on how it was hit. Fixed an issue in which, when a player using the Inkjet touches water and is forcibly returned to their original place, they would be treated as if drowning and be splatted, depending on the place. Fixed an issue in which the camera would abruptly move if the player did a Splashdown near some fences in places like Kelp Dome. Fixed an issue during Splatfests on some stages in which it was difficult to distinguish the color of ink due to in-stage lighting. Specifications for some of the main weapons and special weapons were changed. ▼ Narrowed area painted with a single shot. ▼ Increased ink consumed for each shot by roughly 10%. ▼ Increased damage to the canopy from blaster-type weapons by roughly 38%. ▼ Increased damage to the canopy from charger-type weapons by roughly 50%. Specifications for the terrain or placement of objects in some stages were changed. Adjusted placement of objects near the center of the map, and reduced obstacles. Adjusted placement of other miscellaneous objects. Added a slope going up to the stage. Adjusted placement of objects in Rainmaker. Added platforms and a slope leading up to the center from the open spaces on the left and right of the map. 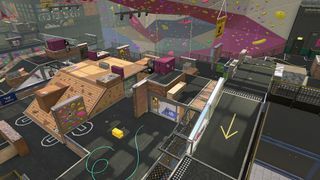 Increased size of the boxes used to climb into the enemy base from the center of the stage, and adjusted the look to match the stage. Added inkable box for climbing to a high point in the opponents’ base, to the left when viewed from the player's base. Adjusted the direction and position of the white objects in each base. Changed terrain in all Battle types. Adjusted trajectory of the Inkrails that leads to the enemy base from both sides. Increased width of the platform beneath the Inkrails mentioned above. Adjusted shape of the sponges near the starting point. Set the area above certain containers near the center as Rainmaker-Free Zones. Fixed an issue on Salmonid Smokeyard in which players could get sandwiched between the terrain and fences if they become a squid on top of certain fences that appear at low tide. Fixed an issue in which, if one player disconnected immediately after putting a Golden Egg in the container, the total number of Golden Eggs would be tallied incorrectly on the remaining players’ screens. Fixed an issue in which, when damage was done to a Scrapper with the explosion from defeating a Steelhead or bombs bounced back from a Drizzler, whether or not the Scrapper was defeated would be displayed inconsistently on the other players’ screens. Fixed an issue in which, despite a Chinook holding a box was defeated, the box would still be displayed on other players’ screens, and Chums would appear from an invisible box. Fixed an issue in which, if the player shot the Hero Splatling while jumping on a ride rail, the weapon would behave abnormally and prevent the player from attacking until becoming a squid. Adjusted the order of display for the guide button for changing perspective and the mark indicating the player holding the Rainmaker. Fixed an issue in which the color of Bravo team’s Ink Mines would show up as Alpha team’s color. Fixed an issue in which the icon for Ink Mines wouldn’t show up properly when having switched between players. When focused on a given player, their opponents’ signals (“C’mon!”, “Booyah!”, etc.) are no longer displayed. 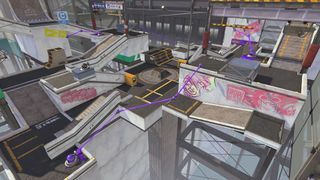 Unified the direction of the top-down camera and turf map on Kelp Dome. Adjusted the direction of the turf map on MakoMart to display the Alpha team’s start point on the left-hand side of the screen as like other maps. Fixed an issue in which after repeatedly winning in League Battle or Splatfest Battle (team), players would occasionally be disconnected after the battle results are recorded and before proceeding to the next battle. Fixed an issue in which, during Splatfests, Off the Hook would not move in the background after taking pictures with amiibo in places other than Inkopolis Square, and then returning to Inkopolis Square. Fixed an issue in which, if the player did a Splashdown in the test firing area, targets on the other side of terrain would also take damage. This page was last edited on 15 December 2018, at 20:40.